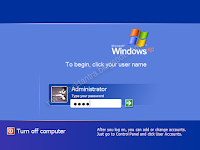 Many of you are using computer for many days and also using Windows XP as a operating system but yet not aware of the installation of operating system to your computer.In this post I am going to mention step by step installation of Windows XP. If you are re installing your OS because it got corrupted than I suggest you, before formatting your complete PC you can follow steps mention here. This can solve your problem without formatting. 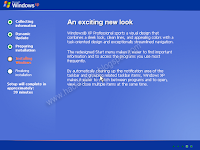 If your problem not solved by this link or you want a fresh installation of windows XP than follow these steps for Windows XP installation step by step. Step 1. The first step should be you have Windows XP bootable CD with you.Now insert this CD into Your DVD/CD drive and reboot your system. Step 2. As soon as you reboot your PC, a message as shown in below figure should appear.Than you have to press any key without delay. If above message not shown than you have to change your boot order manually by pressing function key just after restarting your computer and select option boot from optical CD/DVD drive. *NOTE for different computer the function key may be different it may be F9 in some cases or F2 in other.Its better watch your computer screen while it boot. It will show you the option down there at right or left corner of screen with message press F-x key for boot menu. Now the next screen will come is shown bellow. So now you have to wait for sometime until the OS check all drive and configuration of computer and start copying file to your local drive. Don't press any key in this stage wait for some time until the next screen come which will be like below. Now this is the screen where your computer ask for input. Select the partition in which you want to install the OS. Note-If you want to format any partition than just select that partition and hit enter button. Next screen will appear like this. Here you have to select the 3rd option than hit enter from your keyboard. Now next screen is shown below where you have to press the F key from your keyboard to start formatting and copying process as shown in below figures. After Finishing the above state you are requested to restart your computer.Generally its happen automatically but if not than just restart your computer. Again you are encounter with this message "Press any key" but this time DON'T PRESS ANY KEY. Leave it as it is and let your computer start. Now your computer will start as usual and halt in below shown screen. When the above screen shown than you have to wait for 20-30 Min until it finish all installation process. After this you have to do is only few form filling jobs like provide your name ,organisation or set password for admin.So whenever they appear just fill it and click next.Your installation will resume automatically.You may be also ask for product key during this process so provide your valid product key. I am providing one images which help you to understand how they might be. Now you are done just let The windows restart you will soon see the login window ( only if you provided the administrator password if not than your are directly see your desktop ). Provide your password here and enjoy the freshly installed windows XP to your Computer. on AOL? I require a specialist on this space tto ѕolve my problem. May be that is you! Taking a lߋok forward to look yߋu.